Telus claims an OTA rollout for Google's upcoming OS will happen as soon as October 5 for existing Nexus 5 and Nexus 6 users. Search giant Google will likely announce the Nexus 5X and Nexus 6P this upcoming Tuesday on September 29. The fresh smartphones will be one of the first to ship with Android 6.0 Marshmallow. As for existing Nexus owners, new details reveal that the Marshmallow OTA update may come just a week later. According to a leaked schedule from Canadian telecommunications company Telus, Android 6.0 will be coming to the Nexus 5 and Nexus 6 starting October 5. This is compared to the Android 5.0 Lollipop launch in mid-November of last year, which was a full month behind the launch of the original Nexus 6. It appears that Google will close the gap further this year between the hardware and software release dates. Of course, the OTA updates will likely occur in multiple phases over several days or weeks. As for other Nexus devices like the Nexus 4, Nexus 7, and Nexus 9, the leak does not specifically mention any rollout plans in the short term. 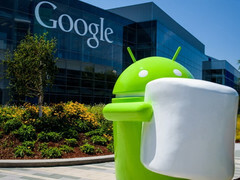 This doesn't mean that the devices may not get Marshmallow at all, but users may simply have to wait for the official announcement from Google when Marshmallow is publicly unveiled.